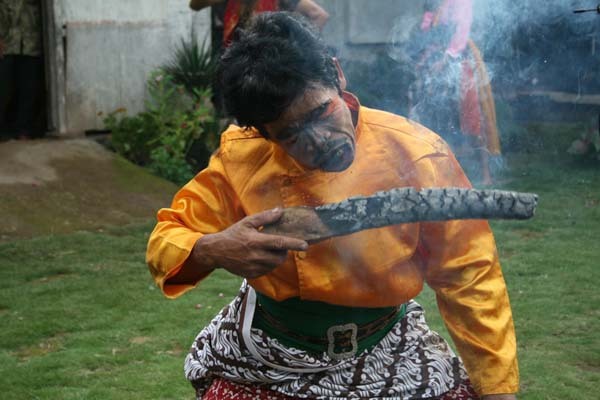 Kuda Lumping is a Javanese traditional arts. Lately culture Kuda Lumping back sounding name among the people since some time ago recognized by the people of Johor, Malaysia as its own in addition to art Reog Ponorogo. According to history, art Kuda Lumping born as a symbol that people also have the ability (excellence) in the face of the enemy or against the power elite who have the royal army. In addition, also as a medium for presenting entertainment that cheap but the phenomenal to the general public. the audience amazed by the attractions of each rider (dancer) Kuda lumping. Remarkably, the traditional dancers from the original Kuda Lumping generally played by girls who dress like boys a royal soldier. Currently, more players lumping horse played by boys. Voice (whip) prod from a player who deliberately imposed this art, the beginning of the game and the entry of a mystical power that can eliminate players awareness. With woven bamboo horses boarded, riders ankles were given this toy started prancing, jumping rolling on the ground. 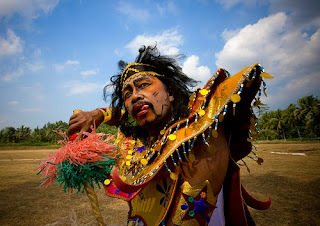 Apart jumped, Kuda Lumping dancers also perform other attractions, like eating glass and peel the coconut with his teeth. Glass that is eaten is the ordinary light bulb as the torch home. He was diligent eating like a starving shard, not grimacing in pain and no blood at the time he takes the glass shard. Bursts of fire coming out from the mouth of the other player started with gasoline accommodate in their mouth and then sprayed on the fire that burns at the tip of a small group of iron made in such a way that the fire did not die before and after the gas sprayed from his mouth. Kuda Lumping on the game, which contained a different meaning is the color. The colors are very dominant in this permaian namely: red, white and black. The red color symbolizes the courage and spirit. The white color symbolizes purity in the liver is presumed to reflect on all five senses so that it can serve as role models in the black. As an attraction full of mystical and dangerous, lumping horse dance done under the supervision of a "supernatural leadership." Usually, this leader is a person who has a high magic that can restore the dancers return to consciousness as usual. He is also responsible for the way of attractions, as well as heal pain experienced by the players Kuda Lumping if there is something undesirable and cause illness or injury dancers. However, when viewed from the perspective of psychology, people who make the process as above is known as the media. The person is just another way of life that, in conveying something (other people are often regarded as a ghost, that the souls of the dead). Is associated with trance medium, namely a situation where someone experiencing separation and loss of consciousness of the surroundings as well as perform automatic movements. In the above case occurred in a player who was possessed by spirits. However, please be aware of sharp objects into the digestive cavity can cause injury in medical terms known as penetrating abdominal trauma. intestine is the organ most often affected in penetrating abdominal wounds, because gut fill most of the abdominal cavity. When the perforation occurred at the top, for example in the abdominal area, it will happen soon after the trauma and stimulation will occur symptoms severe peritonitis. Meanwhile, when the bottom, such as colon, there are no early symptoms because microorganisms need time for a new breed after 24 hours of onset of acute abdominal symptoms due to stimulation of the peritoneum. Social problems that we have to realize that Indonesia is still colonized until now with the influx of foreign culture that tries to get rid of the local culture. Therefore, we as the next generation has the obligation to restore the culture since ancient extinct and no swallowing of modern times. Government and society are expected to continue to explore what culture, which until now barely heard from again, to then re-develop and preserve the cultural values of Indonesia.